A Joshua Focused Photo Dump. I asked him what he was doing, and after a series of several yes or no question directed towards a toddler who wouldn't talk but would only shake his head and squeak a dog toy in his mouth I concluded he was a puppy. Yeah, life and times with a toddler. Main question always seems to be "Which animal are you now?" 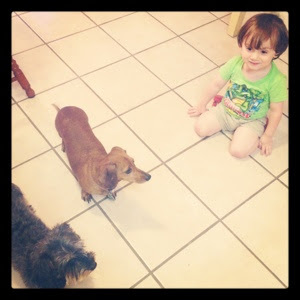 I am afraid this began because I was giving the dogs treats, and Joshua probably thought it looked like a fun idea. Then again his regularly tells us that Maddie is his best friend and is constantly concerned for their well being. I being the great aunt that I am went along with this imaginary play and pulled out the Coco Puffs cereal because let's face it it is basically child approved fake dog food. We sat in the floor for awhile doing tricks for treats, he never made it past sit and stand. I assume that is because I couldn't convince the pups to do anything past the "growl in a bossy way at me because I'm not giving you chocolate cereal" trick. He enjoyed himself none the less. 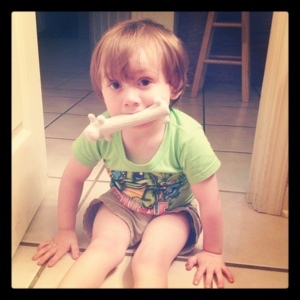 After a few tricks Joshua decided it would be good to eat like a dog, with no hands. His little boy imagination loved it. 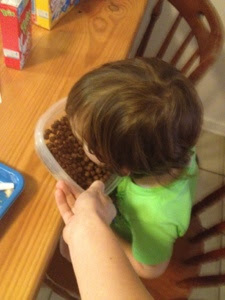 Coco Puffs have proved to be the perfect pretend dog food. If you haven't have BlueBell's Christmas Cookies in July ice cream you are missing out. It is amazing. 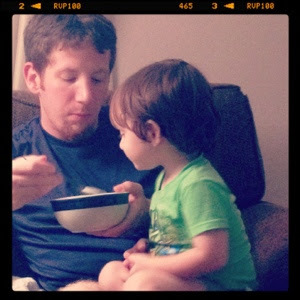 Just ask my nephew who snuggled into whoever's lap was holding a bowl of it. Jeremy seemed to be his target when it came to food snatching. 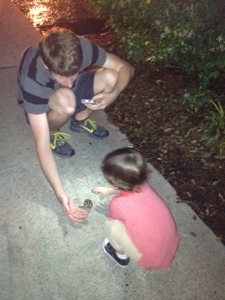 Saturday night we took little J to the park and came upon a toad. Jeremy graciously got it and showed it to Joshua. 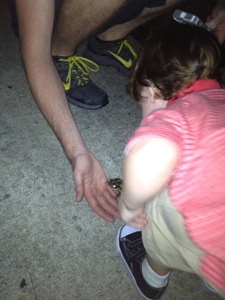 He wanted me to hold his hand, bad choice, I am deathly afraid of any and all things amphibian or reptile. 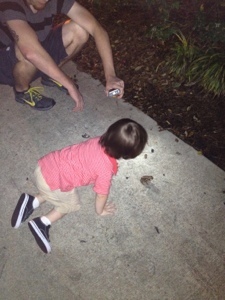 After the frog jumped, I jumped, then Joshua jumped...but he ran away yelling "Dats a twricky frog!" (thats a tricky frog) Priceless! Hope y'all are having a good weekend. I honestly wrote this post over 4 days and have no clue where I was going with it ha! Just remember to stay away from the tricky frogs.